With the summer months well and truly upon us, I've been changing up my skincare a little bit. I think most of us find our skin changes with the seasons, and I know mine certainly does, especially when you throw traveling into the mix, which I tend to do more in the warmer months than in the winter. I've put together a little wish list, incorporating some of my current favourite products with a few that I would love to try. Everything I've selected is well suited to keeping skin looking its best throughout the summer. Enjoy! 1. L'Occitane Shea Light Comforting Face Cream - L'Occitane is one of my favourite brands, so I'm not quite sure why I've never tried their skincare before. Pretty much every face cream L'Occitane has featured on their moisturisers page looks like something I'd be interested in trying, but for my summer wish list, I've picked the Shea Light Comforting Face Cream. Combining a light, silky texture with hydrating properties, it sounds ideal for the warmer months or indeed any time when you want to moisturise your skin without using anything too rich or heavy. 2. Clarins Pure Melt Cleansing Gel - I've recently rediscovered this cleanser and I love it! It's a gel formula that transforms to an oil as it melts into the skin and feels very gentle to use. I use it as a second cleanse after removing my makeup with a micellar water and feel that it does a great job of cleansing without upsetting the balance of my combination skin. 3. Elizabeth Arden Prevage City Smart Broad Spectrum SPF 50 Hydrating Shield - This is expensive, but it's something I would love to try. It offers fantastic sun protection as well as shielding skin from harmful pollutants - brilliant if you spend a lot of your time in cities. Apparently, it's also light enough to wear under makeup. Bonus! 4. Bobbi Brown SPF 50 Protective Face Base - This is similar to the Elizabeth Arden product, but is designed more as a makeup primer that has broad spectrum UVA/UVB protection built in. This would be a brilliant one to take on holiday as it's essentially two products in one slim and portable tube. 5. Urban Decay Chill Setting Spray - From the first step of your makeup routine to the last! Setting sprays aren't something I used to bother with, but I'm getting into them more these days, especially when I want to give my makeup a helping hand to last a little longer. I'm a big fan of Urban Decay All Nighter setting spray, but this new one - Chill - sounds absolutely perfect for summer. It features time release temperature control technology, which keeps your makeup from becoming too warm and sliding off your face. How genius is that?! 6. Jurlique Rosewater Balancing Mist - I am using this at the moment. I really am a sucker for anything with roses in it and this is just so lovely. Delicately fragranced with rose, it hydrates, refreshes and soothes with just one quick spritz. You cannot help but feel like a princess when using this. 7. Indeed Labs Hydraluron Moisture Boosting Masks - One of my favourite sheet masks. I like that they come in a box of four, and they are pretty impressive on the hydrating and plumping front. These are perfect for getting the moisture back into your skin if it's been feeling dehydrated, for example, after a long day relaxing on a sunny beach! 8. Clarins Blue Orchid Oil - I don't currently have one of these in my stash, but it is a product I love and have used on and off for years. Another gem for restoring moisture and radiance to dehydrated skin, it's a beautiful facial oil to use and has a wonderful, relaxing fragrance to it. Note to self - repurchase ASAP! Have you tried any of these products? What are your summer skincare favourites? *This post was in collaboration with L'Occitane. All opinions, as always, are my own. Really lovely wish list! I wasn't aware of the Bobbi Brown SPF 50 Protective Face Base, but it sounds perfect for travelling indeed! I also love the Hydraluron Moisture Boosting Sheet Masks, as you said, they are pretty impressive when it comes to re-hydrating and plumping the dehydrated skin! My skin changes for sure when the weather changes, I get a little more oily and less dehydrated. I think I have dedicated summer products as well, I just never thought about them in detail. I would also love to try the UD chill setting spray as I've heard so many good reviews! Oo, I love the sound of the Jurlique mist. I'm a sucker for anything rose as well, so that really peaked my interest! I love the Jurlique Rose Water Misting Spray! I've never tried the UD chill spray but I have the all nighter spray, and I love it! For summer, I love cream and gel blushes so that's what I tend to get when it gets warmer! I haven't tried any of these products but my favorite summer beauty product are Innisfree No-Sebum Mineral powder since it's minty and great for my oily skin. You have such an amazing wishlist. Ooooh yes to Clarins! I love this list, and think it's so important to take good care of your skin with items like these. This is such a great wishlist! I really want to try L'Occitane products...I've heard great things about this brand! You have some great products on your wishlist. I would love to check out out some of them. Never used any of these products to be honest, they sound great though! I really want to try the Clarins oil! Lovely products you have selected. the body shop chemical peel cleansers are on my skincare wish list as well as I've been meaning to make an order from the ordinary as well. I highly recommend the Elizabeth Arden sunscreen! Yes, it's pricey as f*ck but it's really good! It feels oily when you first layer it on but very light weight and dries down in a jiffy leaving a matte-ish finish to the skin. It's also an amazing base for makeup! Skincare has always been an issue for me since I am an oily skin girl and recently exam stress has got my skin having mood changes! 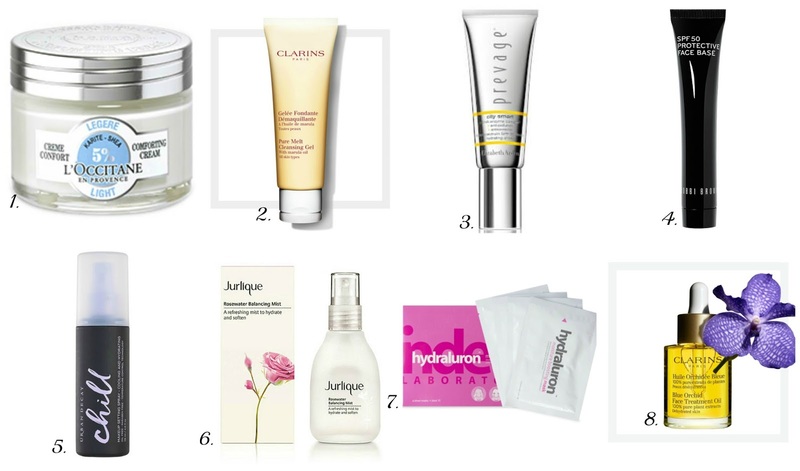 Will defo be checking out some of these especially the Clarins cleansing gel. Must have list. Great Post. I haven't used any of these listed products but they all do sound amazing! The Urban Decay Allnighter setting/fixing spray is very high on my wish list but maybe I should swap it for the Chill setting spray! I really need products to help moisturize my skin, it's going crazy lately! You've listed some really great quality products, thank you for sharing these!